Now that Lent is upon us, I am ready to make it a good one. So I have my books to read, my devotions to pray, etc… But last night after attending Stations of the Cross, I was filled with thoughts of Jesus’ suffering then, and our own suffering now. I thought – where in nature could I find what my heart was feeling? And I had my answer: The Badlands. A few years ago, Tom and I were blessed to be able to visit South Dakota. We packed up the car and drove to Rapid City where we spent a week enjoying that beautiful part of the country. 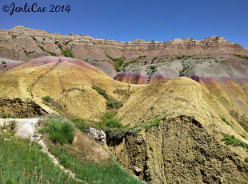 We stopped at Badlands National Park and thoroughly enjoyed it. In some places, the land was so rocky and dry I felt like I was walking on the moon. In other areas there was a bit of grass poking out here and there, before the landscape would change again to fields of grass with bison and prairie dogs. It was truly an awe-inspiring place.